There are some manual garden tools you just can’t live without, like this varied tranche of horticultural essentials. During the course of summer we’ll be listing our favourite plant management tools – secateurs, pruners, loppers, snippers, branch saws, weeders – and general garden maintenance gear – shovels, trowels, rakes, edgers and hoes. Although admittedly quite boring, these are all essential garden accoutrements that you need to know about because – oh yeah, baby – that’s how we get down. No matter how thorny the garden task, and no matter how weedy you are, these are the tools to get the job done. What do Bypass and Anvil mean? Before we start, we should address at least one particular piece of garden jargon that applies to both loppers and pruners: bypass and anvil. Bypass secateurs and loppers have blades that are designed to pass each other smoothly as they cut, like scissors. They are perfect for green wood and delicate stems, as they give precise, clean cuts and avoid damaging or bruising the branch. Anvil loppers, on the other hand, have one sharpened blade that cuts down on a flat hard plastic or rubber block, rather like a small chopping board. Anvil-equipped loppers and pruners are great for dead wood and dry, hard, old growth that needs cutting back. Mind, most amateur gardeners will happily make do with either mechanism since they both essentially perform much the same task. And now you know your bypass from your anvil. Read on for the lowdown on the best manual garden tools currently available. This long-reach branch lopper is a godsend. No, really. Unlike the average lopper that involves a lot of outstretched arm movement – more so if it’s an extension model – this one uses an ingenious bow-and-arrow-style system that keeps both arms on the same plane. To use, simply place the palm of one hand around the adjustable lower grip and grab the handle on the end with the other. Now pull back as if using a bow and arrow – SNIP, offending branch removed in an effortless thrice. The SlimCut has two gears: a firm feel for short pulls – good for slim branches – and an easier-going gear that requires a longer stretch of the arms but is great for cutting through thicker branches. Another excellent benefit with this system is that it enables the user to access hard-to-reach areas, whether it’s tackling a branch surrounded by thick foliage or reaching for a branch a metre or more above head height. And all without having to stretch out your arms. If you do a lot of lopping in inaccessible areas, have short arms, or are a little frail in the muscular department, then this model comes highly recommended. It will change your lopping life. Where most other pruners come with two fixed grip levers, this model has a finger lever that swivels 45˚ as you close your hand. We can’t believe what a difference this makes to the hand and wrist muscles. Fiskars states that its PowerGear mechanism ‘makes cutting up to 3.5 times easier than standard mechanisms’ and we bloody well agree. These particular pruners are fitted with an anvil mechanism so they’re good for hard, dry branches up to 26mm in width. They’re extremely comfy in the hand and the gently sprung levers don’t open too wide, making them pretty effortless to use. A stalwart addition for your trimming needs. Shears are great for trimming hedges on the fly, general topiary duties and edging wayward grass around borders. However, this writer has found that some models are too heavy and large to wield about for long periods of time, especially with arms outstretched. By contrast, this pair of ultra lightweight Japanese-made shears are equipped with razor-sharp blades that are just the right length (14cm) for regular use. The white oak handles, too, are relatively short and are sheathed in knobbly rubber that feels reassuringly grippy in the hands. The blades themselves are made from SK steel (a hardened alloy comprised of carbon and manganese), the preferred material of kitchen knife manufacturers. If you’re after a small pair of light shears that cut like a razor and won’t impact too much on the forearms, consider getting your mitts around a pair of these. If you find your hands are too small for most secateurs, here’s a great pair of ‘lady size’ bypass pruners that do the job admirably well for less than £12. Exceedingly light and small in the hand, these Spear & Jacksons are well up to the task when it comes to snipping back that most annoying of garden plants, the vexatious thorny ninja (aka bramble). Aside from the slim, easy-grip handles, this model is also equipped with two-stages of jaw width – 75mm for small delicate stems and 114mm for slim green branches. The combination of its SK5 steel blades and bypass cutting action, meanwhile, ensures green stems are cut with minimal bruising. A top budget-priced buy for those who just can’t get along with normal sized secateurs. These budget-priced bypass secateurs are a little larger in size than the Spear & Jacksons reviewed above so perhaps consider them if you have bigger hands. Like the S&Js, these also feature two different jaw widths so they could quite easily be used by someone with smaller hands. These Germanic grass scissors are a boon for trimming the edges of a small suburban lawn without having to reach for the electric strimmer. Mind, even if you have a lawn the size of a tennis court, they’re just as handy for tidying up bits of stray grass you forgot to strim. And, of course, they come into their own when trimming a grass border that’s perilously close to your prized Saffron Crocus collection. The Wolfies have a comfortable, smooth action and come equipped with a pair of curved blades that can be swivelled 180˚ so you can also use them as standard shears to perform delicate topiary on a hedge or an unruly bush. And when you’re finished, simply flick the blade lock for safe storage. Well handy. When it comes to blade manufacture – be it kitchen knives or, in this case, garden secateurs – the Japanese are past masters in the art. And as we all know, they’re also connoisseurs of creative gardening. Put the two together and this is the result – a pair of KA70 carbon steel bypass secateurs probably sharp enough to shave with. Now, it must be said that these premium secateurs are of the old-fashioned variety which means a simple spring between two slim, plastic-sleeved steel handles. Consequently, they do require a bit more muscular action to prevent the jaws from springing wide open (some modern secateurs feature a switch that sets the maximum open aperture at two different positions – short and long). Also, these are not the type of secateurs to leave lying about in the flowerbed because that beautiful metal work will be soiled. However, when it comes to snipping delicate stems and thin branches, these secateurs cut with utmost precision leaving no bruising and an exactness of cut that your plants will probably thank you for. If you’re a truly discerning horticulturist who insists on using only the sharpest and best quality garden tools in the shed, then make these secateurs one of your very first ports of call. Picture these scenarios. You have a tall-standing and particularly unwieldy, climbing rose bush and you need to dead-head a few wilted flowers without being ripped to shreds by its unforgiving mass of thorns. Or perhaps you have a deep and beautifully maintained flowerbed and would rather not trample through your prized Peony shoots to get to the Wisteria at the back. Or maybe you have limited mobility and can’t reach some areas of your flowerbeds. What you need is a pair of these handy long-reach bypass pruners that don’t just snip off wilted and/or living flowers, they also hold the base of the cutting in their jaws so it doesn’t drop to the ground. Admittedly, the gripping action can be a bit hit and miss; it seems to work best with sappy stems like daffodils with a thickness up to 7.5mm. Part of S&J’s Kew Gardens range, these long-reach pruners are 60cm in length and come equipped with tough carbon steel blades, a lockable hand trigger, a 180˚ rotating body and a head that angles up to 20˚ for awkward cuts. Very handy they are, too. Got a few tree branches that are too thick for your pruners or loppers? This 135mm folding saw is well up to the task. Simply unfold, select one of three sawing angles and get in there and give it hell. The Gardena’s mean-looking serrated blade is sharpened on three sides and is short and stiff enough for effortless cutting of branches up to 50mm thick and possibly more. When done, simply squeeze the button and carefully close up the blade, flick knife-style. If 135mm seems too short a blade and you need to cut down a branch up to five metres up, then perhaps consider the 300mm CS model with telescopic Combisystem handle and curved tip for coaxing branches down. If you’re looking for a lopper with pair of blades sharp enough to shave with, look no further than this serious piece of gardening kit. It’s not just the sharpness of the blades that stand out here but the fact that they extend from 30cm to 80cm simply by pressing a button on each handle and moving the telescopic arms up through any one of six locked positions. The WS loppers use a bypass mechanism so consider them if you’re pruning the upper echelons of your prized cherry tree or any other green-based vegetation that’s out of arm’s reach. We tried them on the apple tree and the blades cut through even some of the thicker branches like proverbial butter. We should add that these loppers are quite heavy and the mechanism is fairly stiff when new, although this thankfully eases a little with use, so don’t expect to use them for long periods of time without taking some much needed rest. Also, in fully extended mode you will need to stretch your arms out wide if cutting branches thicker than 30mm, so perhaps avoid them if you have really short arms and opt for the Gardena Pruning Lopper SlimCut (above) instead. This is not just any old spade, it’s ergonomically designed with a 17˚ handle and a 26˚ degree angle at the scoop section that helps keep the soil load level with the ground when lobbing it into the old bow and arrow. Put another way, less shoulder articulation equals less effort and therefore more strength to lift a pint afterwards. Fear not if the ground’s as solid as concrete because this one’s got a pointy tip to penetrate deep and hard and its shaft is made from boron steel with industrial welding for added strength. The Fiskars is of average man length (1.25m) and quite hefty, so it’s not one for weaklings or those of shorter stature. But worry not, we’ll soon have a shorter, lightweight option for your perusal on this very page. 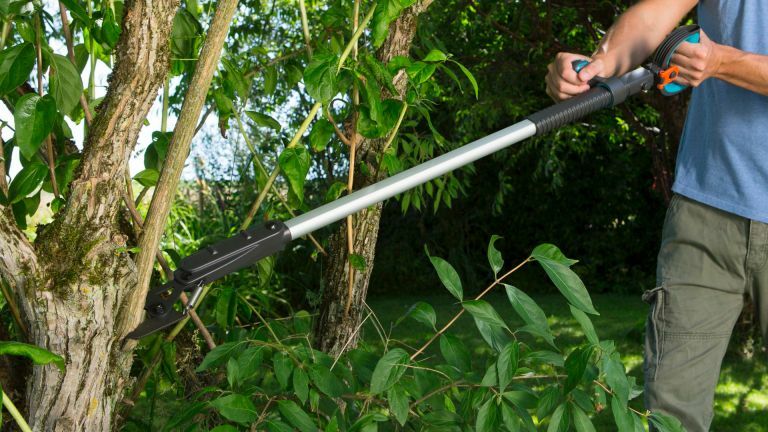 This French-made weeder makes light work of killing weeds without ever even having to bend your knees. The Wonderweeder is comprised of a waist-high transparent tube, a funnel-type structure on the bottom and a push-action palm-operated button on top. Simply pour in a small amount of concentrated weed killer using the supplied dosing cap and then fill up the rest of the tube with fresh water. Now place the plastic funnel over a weed and press down on your palm. And that’s it. A small, pre-measured dose of weed killer is administered directly on to the culprit without contaminating anything around it. The Wonderweed may look rather curious but it's just the ticket for effortless weeding of pathways, driveways and patios, and a much safer option for those with pets. Yes, it’s a scoop, a simple hand scoop. But you’ll rue the day you didn’t buy one when you elect to ship in a large bag of compost for the border plants only to find that your existing trowel is too slim to scoop more than a thimble of soil at a time. This dish-shaped piece of hammer-finished carbon steel provides top scoopability when shovelling compost and top soil from bag or barrow to borders and dead grass patches. The weatherproofed ash handle, meanwhile, is one of the best shaped handles that this handle handler has ever handled. It also comes with a 10 year guarantee (at just £6.80, we’re not sure why) and a leather strap for storage.